Is a missing tooth affecting your confidence or the health of your smile? Dental implants allow you to replace one or more teeth with results that look completely natural. To get started today, contact Bellevue Family Dental in Bellevue, Washington. Dr. Daniel Ghorbani (formerly 'Mashoof') can transform your smile and make sure you have the best possible oral health. A dental implant is a post, usually made of titanium or zirconium that Dr. Ghorbani (formerly 'Mashoof') places into your gum where there is a missing tooth. In fact, he prefers zirconium implants and has been using them since they first became available in the United States. After the implant is installed and it fuses with the surrounding bone and tissue, Dr. Ghorbani (formerly 'Mashoof') connects it to an artificial tooth that matches the rest of your smile. The implant is strong enough to allow the artificial tooth to function just like the rest of your teeth. If you have more than one missing tooth, you may need more than one implant. 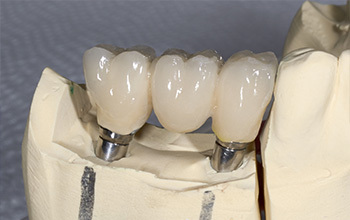 Some patients are also candidates for an implant-supported bridge. The dental implant process requires at least two appointments. During your first appointment, Dr. Ghorbani (formerly 'Mashoof') surgically places the implant. He might also take impressions of your teeth so he can have a laboratory create a custom artificial tooth. After Dr. Ghorbani (formerly 'Mashoof') places the implant, you’ll wait several weeks to give the implant time to fuse with the surrounding bone and gum tissue. Once this has occurred, you’ll have your second appointment. Dr. Ghorbani (formerly 'Mashoof') will then attach the implant to your new artificial tooth, securing it permanently so that it fills in the gap and perfects your smile. You may have a series of follow-up appointments to make sure the implant is secure and functioning properly. Dental implants fix cosmetic issues and prevent neighboring teeth from shifting into the space of a missing tooth. They can also prevent bone loss in your jaw. With the right dental implant, you can return to a more natural pattern of eating and speaking, and your jaw and face will look more balanced. Since implants aren’t noticeable, you can also feel confident in your new smile. To request a consultation about dental implants, contact Bellevue Family Dental by calling or requesting an appointment online today.